Image | This entry was posted in Uncategorized and tagged backyard, beneficial insect, bugs, butterfly, caterpillars, flower, gardening, monarch, summer. Bookmark the permalink. Stunning! Great camera work! What kind of flowers is it on? I want to get some monarch friendly plants in my yard. 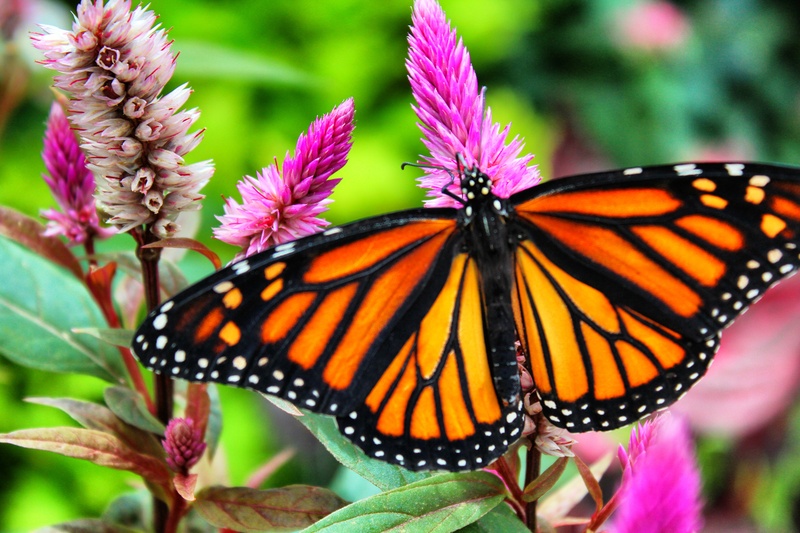 How beautiful…so far this summer I have only spotted the Monarch three times and not even in my garden. Love that plant too. Thanks! We haven’t seen very many this year, either…hope that’s not a trend! I wish we had Monarchs here. What exquisite butterflies. They are quite beautiful. We haven’t seen as many this year as in years past…I hope that this is just an anomaly and not a precursor of things to come. Gorgeous photo. I haven’t seen many monarchs this year. I hope it is not a trend. We haven’t seen many this year, either. Hopefully, not a harbinger of butterfly doom! I’ve got a Monarch photo in the draft queue, too! Hope we see many more in the weeks to come! Can’t wait to see it! Haven’t noticed nearly as many this year, how about you? I know. It does seem a bit sparse. 😦 The big migration (such as it is) doesn’t start until later tho. Hoping for the best!